Sidney Jellinek [or Jelinek] was born in Wilmington, Delaware, on March 18th, 1899. After graduating from Central High School, he matriculated at the University of Pennsylvania in 1918. 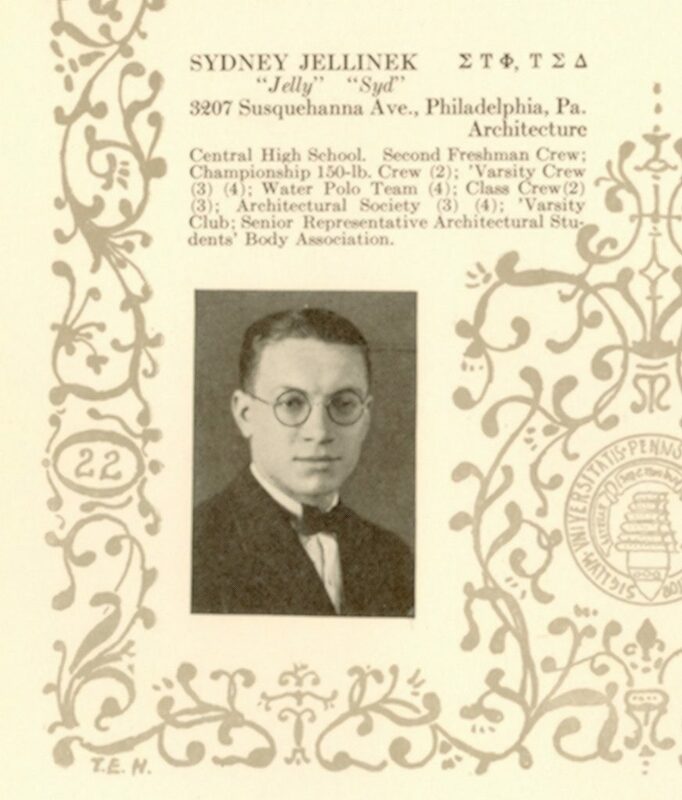 While attending Penn in pursuit of an architecture degree, Jellinek was a member of the Sigma Tau Phi and Tau Sigma Delta fraternities as well as of the Architecture Society and the Houston Club. Jellinek was a member of the 150-pound crew in 1920 before moving up to varsity crew for the 1921 and 1922 seasons. He also served as the senior representative to the Architectural Students’ Body Association and as a member of the University Infantry Unit as a private before graduating in 1923 with a bachelor’s degree in architecture. Not long after he graduated from Penn, Jellinek’s abilities as a rower were acknowledged by the U.S. Olympic Team, who asked him to be a part of the 4-man crew team. As the number three rower on the team he helped earn a bronze medal for the Americans at the 1924 Olympic Games in Paris. Upon returning from France, Jellinek took a job as an architect in the office of William H. Lee but would continue to row competitively as a member of the Bachelor’s Barge and University Clubs. He worked as an architect for another fifty years before retiring in 1977. Jellinek died on March 9th, 1979, in Philadelphia.